Danish-American Millie Corson made two unsuccessful attempts on the Channel; the first unsuccessful, was England to France, she swam for 14hrs. 30mins. She was two miles off France, at Sangatte. The second swim on the 27th August 1926 was successful, she swam from France starting at Cap-Gris-Nez and finished at Shakespeare Beach, her time was 15 hrs. and 28mins. She again attempted to swim from England to France, 6th Sept 1927. Starting from the South Foreland, she swam for 9hrs. 40mins. She was 4 miles from France. This was an attempt for the Dover Gold Cup. Listed as age 27, mother of two children. Billy Kellingley was a leading figure in long distance swimming. 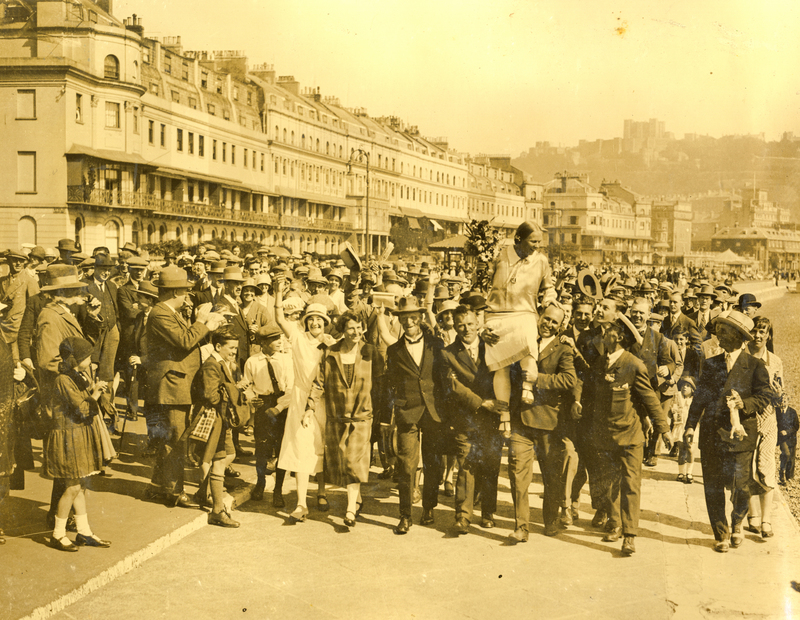 He was the Brighton one mile Champion, and the winner of the half mile Championship. He trained Millie Corson, Jabez Wolffe, and in 1924 he trained Miss Lillian Harrison, an Argentine Distance Swimmer. Others include The Zittenfield twins, Frank Perks who swam for ten hours in his France to England attempt, Mrs Myrtil Huddlestone who swam for 21hrs 13mins England to France and had 7 miles to go to Cap-Gris-Nez, Edouard Bernat who swam for 15hrs from Shakespeare Beach, Captain George Morris, Miss Eva Morrison, and lastly, George Brewster, who later swam in the 1950 Mail Race. More photos of Corson, Mrs Millicent C.